See 'Blog' page for posts about Reflexology Lymph Drainage, Adapted Reflex Therapy, Reflexology for Digestive disorders and Stress. Looking for a reflexologist in West Sussex? Lila Davis Reflexology is conveniently located in Burgess Hill, within easy distance of mainline rail and road networks. Wivelsfield is our closest rail station within a few minutes walk and we are also close to Burgess Hill station and a short car ride from Hassocks and Haywards Heath stations. There is easy car parking on the road and my current therapy room is based on the ground floor for easy access. My new garden cabin will be opening in April 2019 offering a tranquil dedicated space in a lovely garden setting. If you have not tried reflexology before but are interested in what this relaxing, holistic therapy can do for you, why not send me a message or give me a call? If you already love reflexology and want to discuss any specific issues, such as IBS, chronic fatigue, stress, sinusitis or any other health issues I would love to hear from you. My qualification and practical training included specific techniques used to assist with sub-fertility - is this something you are looking for help with? Give me a call for more information and further details. I am qualified in Aromareflex, so I can prepare a blend including essential oils in a cream or gel base, which I use for the treatment and you can take the 50ml pot home too! "The treatments were very soothing and relaxing I believe the treatment also helped with some low level back pain and left me very calm and restored. I shall be booking regular treatments for my wellbeing"
I trained at the Three Shires School of Reflexology and hold the best reflexology qualification available in the UK; Level 5 Diploma in Practitioner Reflexology. If you would like to know more about my training please click the logo. Since qualifying I have moved back to Burgess Hill in West Sussex. 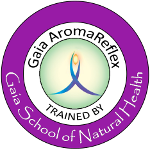 I have undertaken further CPD training in Aromareflex and Adaptive Reflextherapy since then with the Gaia School of Natural Health. I have joined the volunteer team and provide reflexology treatments each week at St Peter & St James Hospice at their beautiful Beaconview Centre.